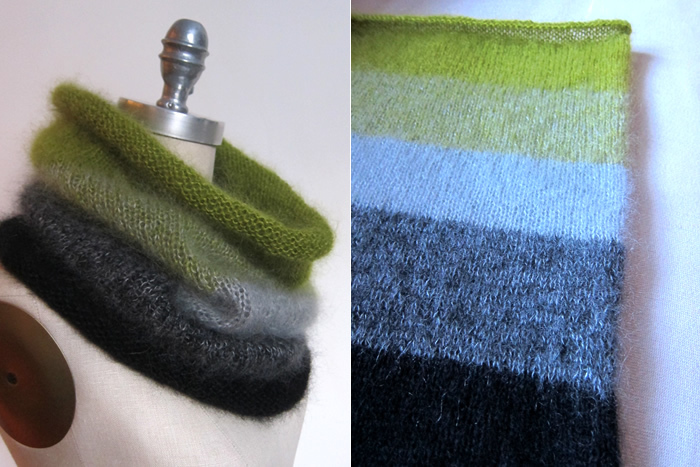 A customer came in wearing the Ombre Cowl by Hilary Carr the other day and Mona and I were instantly smitten with the fuzzy simplicity of this easy colour-block accessory. Mona cast on first and wore her gorgeous version to work last week. I cast one on for a store sample on Wednesday evening and finished it up about 20 minutes ago. This was quick and fun and feels light and cozy around my neck. Rowan’s super-soft blend of kid mohair and silk is incredibly wearable by all but the most sensitive and the beautiful haze is really impossible to reproduce with anything else. The Ombre Cowl is knit in the round with the yarn held double throughout. Three colors of Rowan Kidsilk Haze are alternated to create ombre stripes. Lovely! Click here to view project details on our Ravelry page. Maiden Hair and Camelspin – fresh delivery!